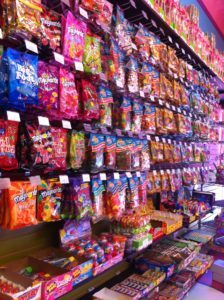 One thing that can bring people of all ages and genders together is candy because let’s face it CANDY MAKES YOU DANDY! 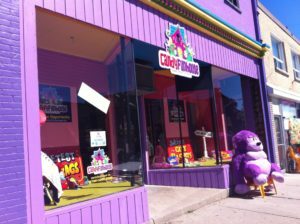 I can think of no where better to get your Candy Dandy on than CandyFunhouse in the Preston downtown area of Cambridge, Ontario. You really can’t mistake the fun building with it’s bright purple facade and colourful signs. On dry days you might even spot the store mascot: a giant purple gorilla named C.C. (for Candy Crusher) sitting outside to welcome you in. 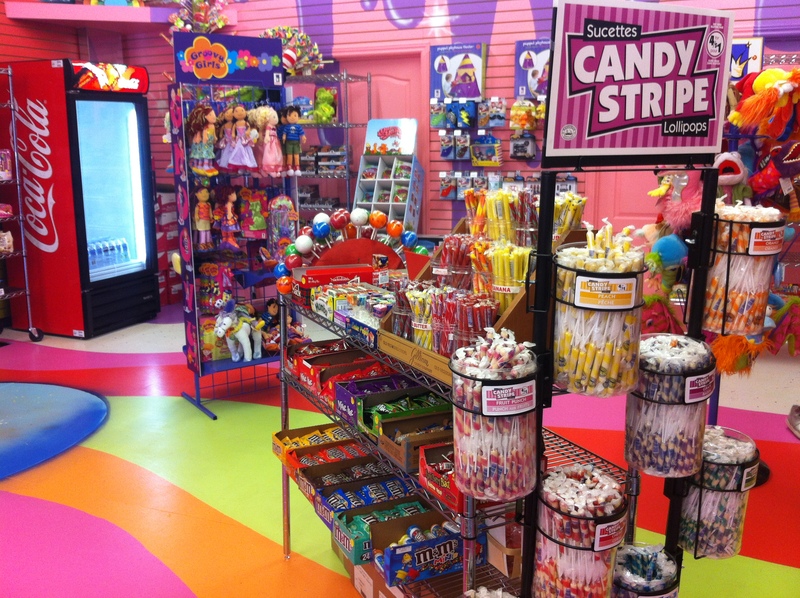 Entering the store itself brings you back to all your childhood dreams. 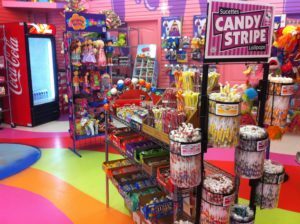 Bright swirling colours on the floor and walls, smiling staff behind the counter and candy as far as the eye can see. One of my favourite parts about this store is the candy they have chosen to carry isn’t what “kids these days” want. It’s what we wanted, and what our parents wanted when they were kids. Oh sure they call them “Candy Sticks” now, but you and I both recognize a Popeye’s cigarette if we see one. They have gum drops and hard candy, licorice and chocolate from the two U’s, the UK and the US of A. I love discovering things that I only heard about on television have now come to my hometown and I can now taste them in my mouth and judge how awesome they are for myself. 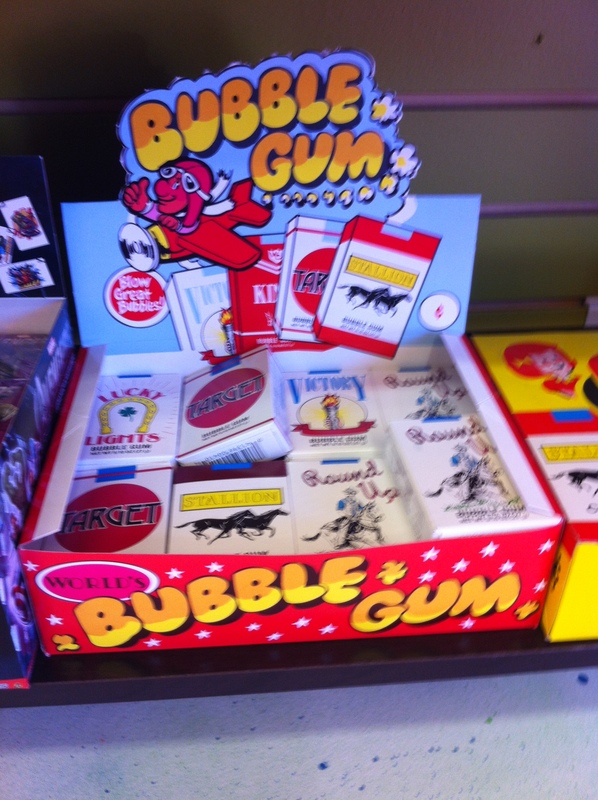 The store is also home to some other really interesting non-candy items. They carry much of the Blue Q line of products which include funny sayings and hilarious designs on a variety of objects from purses and wallets to soaps and hand sanitizers. They have recently added some really awesome hair pieces from a local artist Punks and Pretties. And did I mention they have Fraggles?!? Last weekend we had our first official tweetup there and it went wonderfully. For many of the attendees, big and small, they had never been in the store made of dreams before. It was absolutely delightful seeing all of their eyes light up and the squeals of delight from the young and young at heart. The staff entertained us and helped with our choices. Their enthusiasm for their product showed very well and everyone walked away with a bit of a sugar rush and a commitment to come back. One person even ordered an entire case of Whatchamacallit’s! Two really awesome additions have been made to the store in recent months, which was part of the reason we had a tweetup there in the first place. ICE CREAM – Seriously – who doesn’t love ice cream? Lots of yummy flavours to choose from and since we planned the event in advance, the team at Candyfunhouse provided us with a few bowls of candy. This of course allowed us to all dress up our cones however we wished. The peach ring life preserver and sharks swimming in the delicious ice cream were a popular choice. JELLY BELLY – You may not know this, but I personally love the stuff. When I was younger my family would trek all the way to Simcoe to go to Jelly Bean Junction. They have now closed but I can still get my Jelly Belly fix right here in Cambridge. Honestly – if you haven’t had a chance to make it to the store, you really need to get there. It’s a gem and the staff are amazing. 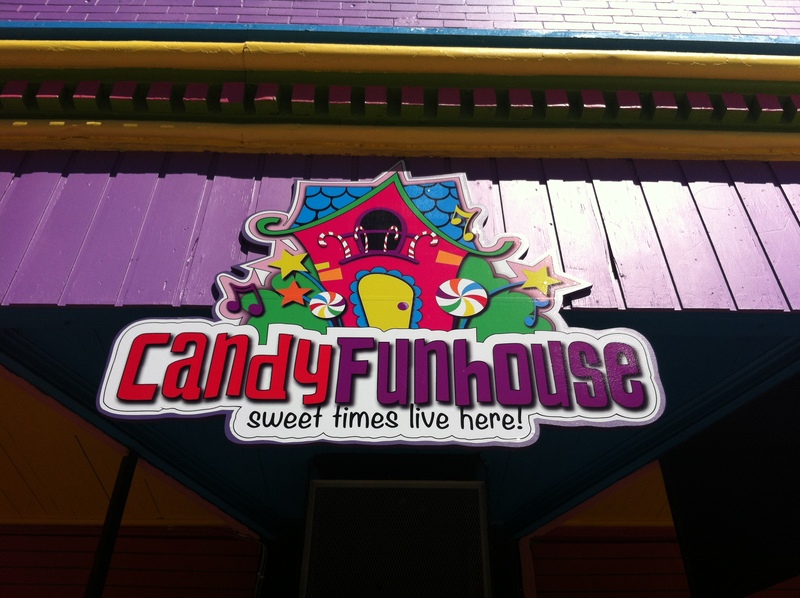 Candyfunhouse could be the most magical place in all of Cambridge. Candyfunhouse Sweet times live here indeed! Note: Corina Harris is not paid by Candyfunhouse to promote their store or their products. All opinions expressed in this post are those of the author. Great store, I go there often. We could use something like this in Hespeler’s downtown.